This is the second in a series of posts that will analyze various aspects of legal malpractice cov-erage; today, we’ll examine the various types of legal malpractice insurance deductibles a law firm can purchase. I. Legal Malpractice Insurance Deductible: Loss & Expense – the deductible applies to both indemnity payments (loss) and defense costs, i.e., legal fees (expense). 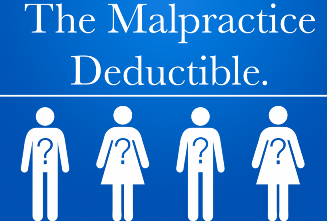 This is the most common type of deductible, and is found in nearly all legal malpractice policies. Once a legal malpractice claim is made, and the insurer decides that it’s covered and assigns defense counsel, the firm must pay all indemnity and defense costs until the deductible has been fully paid. Only then will the insurer begin paying. As a practical matter, the payments made by a firm are nearly always for defense costs, as few legal malpractice claims are settled without some defense costs first being incurred. II. Legal Malpractice Insurance Deductible: Loss Only – the deductible applies only to any judgment or indemnity payment, but not to defense costs. It’s also called “First Dollar Defense”, because the insurer pays defense costs from the first dollar, rather than the firm paying those costs until its deductible is exhausted, as with the Loss & Expense Deductible above. When a legal malpractice lawsuit is filed, defense costs are always incurred before an indemnity payment is made, and in many cases, no indemnity payment is made, be-cause the suit is dismissed with prejudice or defeated via a Motion for Summary Judgment. In this case, the insurer charged about $500 more – almost 10% – for the loss only deductible. In our opinion, an additional charge of about 6% of the premium is fair in most cases. Anything less than that is inexpensive; anything more, as in the example above, is ex-pensive. At our recommendation, the firm declined the loss-only deductible option. Note: the higher a firm’s deductible, the more insurers will charge for a “Loss Only” deductible, because the more they’ll pay for defense costs if the firm is sued. III. Legal Malpractice Insurance Deductible: Annual Aggregate – the firm pays its per claim deductible – both loss and claim expenses – each time it incurs a claim, up to the annual aggregate, which is the maximum amount that it’s responsible for during the policy period. After that, no further deductible applies, no matter how many additional claims the firm incurs during the rest of the policy period. This may be an attractive coverage for firms that incur a high frequency of losses, depending on how much additional premium the insurers charges.